We don’t often have fancy desserts in our house as they are guaranteed to be high in carbs. Lets face it though whether low carb or high carb, desserts are still going to be decadent and not so friendly on the waist line this is why they are a treat and usually people don’t eat them every day. I made this dessert the other day and it didn’t last very long. My hubby and I had a small sliver each but my kids and their friends devoured the rest in 2 days. Considering my 14 year old son is 6’4″ and 120lbs I don’t think he gives a second thought to his waist line at this point in his life. So with all that said a slice of this dreamy light cake is 8.7g net carbs and 16 Weight Watchers points. So if you are following the Weight Watchers program you could indulge and use up some of your weeklies or up your activity points. This dessert is worth about and hour and a half of heavy exercise. Once bowl is chilled beat whipping cream till light peaks form. Add 1 tsp of vanilla and 1 tsp Splenda and beat till peaks are slightly stiff. Refrigerate till use. Preheat oven to 350. 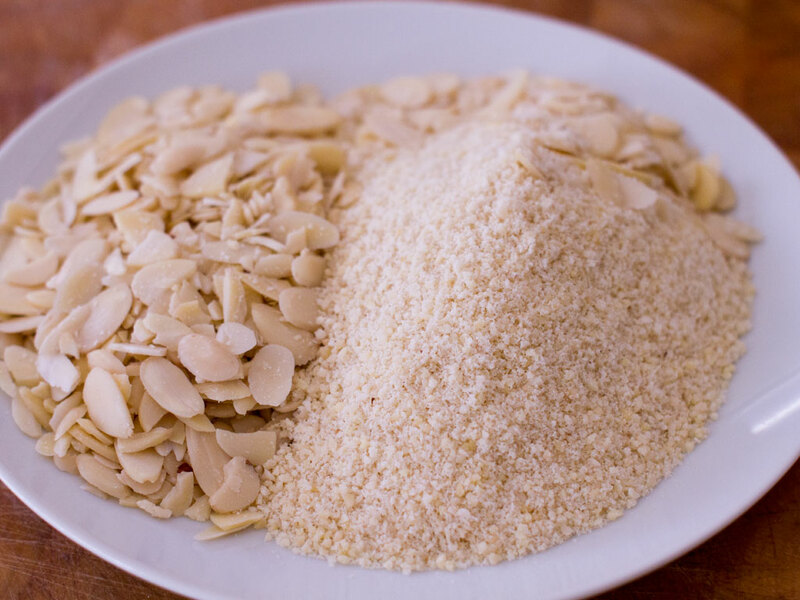 Mix together the butter, almonds, and almond flour. Press into the bottom of a 9 x 9 dish. Bake for 15 minutes or until golden brown. Cool completely before adding additional layers. 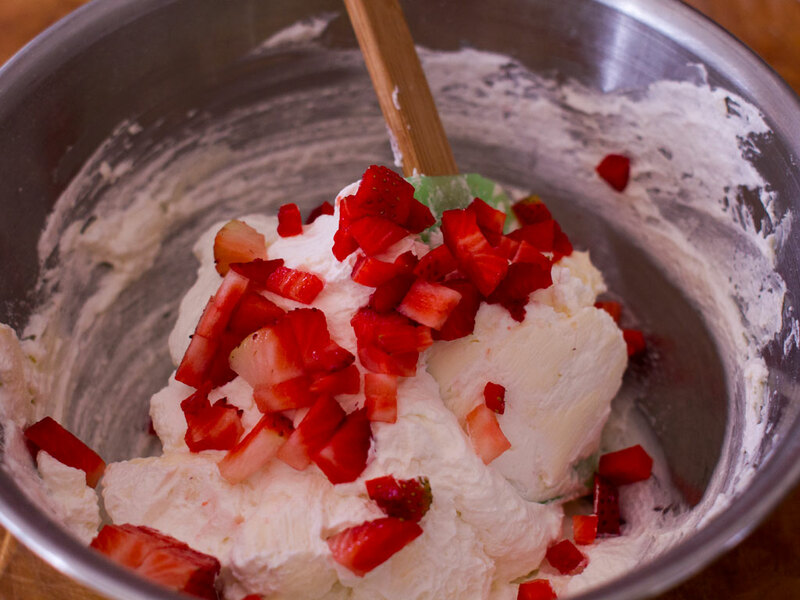 Mix the cream cheese, 1 cup sifted Splenda, the chopped strawberries and 1 cup of the whipped cream. Spread onto the cooled shortcake. 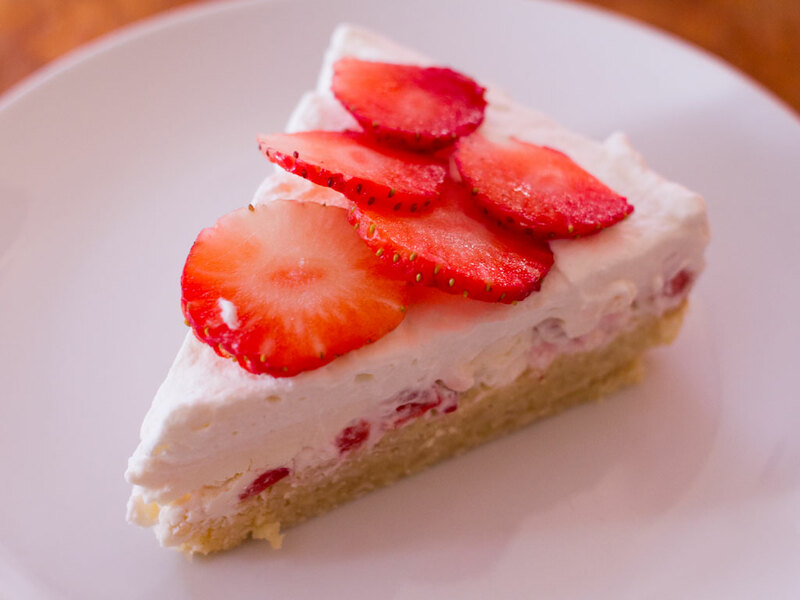 Spread an additional layer of whipped cream over cream cheese layer and top with sliced strawberries. I’m wondering if there’s some other sweetener you would recommend in place of Splenda? I’d like to make this for Easter… my father is diabetic, but I’m sure when my children see this they will want some too. Artificial sweeteners are a big ‘no-no’ for my little ones. Hello Jennifer, thanks for popping by! There are a few natural options you can use here but be sure to taste as you go as each one has different “sweetness” than others. Stevia. It is a herb extract and 300 times more sweet than sugar so be careful. For this recipe you will need about 2 1/2 tsp of the liquid or 24 pkgs of the granular Stevia blend in the cream cheese mixture. Sprinkle the Stevia in the cream slowly and in SMALL amounts till it is sweetened to your taste. Make sure when you are buying it you get a pure blend. I have used Stevia many times and it is great, a little pricey, but a nice substitute. Monk Fruit Power. Just stumbled across this one and will get some this weekend to try out. It is from the Kal Monk Fruit which is native to China. It is 200 times more sweet than sugar and less refined. I would suggest 1 tbsp to start and test from there. Again, small amounts in the cream as you whip. Agave Nectar, one of my favourites, is similar to honey in appearance and flavour but lower GI. The general rule of thumb for Agave Nectar is for each cup of white sugar (or Splenda) replaced, use 2/3 of a cup of agave and reduce other liquids by 1/4 to 1/3 cup. I would suggest about 1/4 tsp to start when whipping the cream and 1/4 cup to start in the cream cheese. You don’t want the mixture to be a sloppy mess. I hope this helps and please check back and let us know what you used and how your family liked it. Happy Easter!!! My crust was very crumbly. Followed insructions until golden brown (20 minutes for my older oven) Could I add an egg to make it stick together? Otherwise it was a perfect dessert! Hello Heidi! I am so glad you enjoyed the dessert, its a perfect summer dessert. You can try to increase the butter a bit or add enough cold water to bind the dough but if you add egg it may not be as short as you would like and could be a little hard. If you try it with egg and it works please come back and update us.